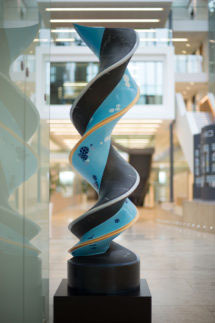 During the summer of 2015 Cancer Research UK launched a DNA inspired art trail across London with a series of 21 DNA double helix sculptures. They invited some of the biggest names in the world of art and design to create unique pieces by asking them ‘what’s in your DNA?’ One of these designs, ‘What Mad Pursuit’ by Kindra Crick, has now found a permanent home in the LMB, where co-discoverer of the DNA double helix, Francis Crick, undertook his work on genetics from 1949 to 1976. ‘What Mad Pursuit’ explores the creative possibilities achievable through the fusion of art, science and imagination in the quest for knowledge. Kindra Crick is the granddaughter of Nobel Prize-winning scientist, Francis Crick. Francis was married to the artist Odile Crick and Kindra’s work has been influenced and inspired by both her grandparents’ work. Kindra creates art that gives visual expression to the wonder and process of scientific inquiry. She has a degree in Molecular Biology from Princeton University and a Certificate in Painting from The School of the Art Institute of Chicago. 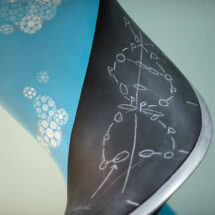 Part of the design on Kindra’s sculpture represents the blackboard drawings of Francis, which he created to help explore and solve his scientific ideas.